What should have been a day of sorrow for Senator Leila Dilemma ended up having a party. The fact she waved her hand confidently as she was arrested aroused suspicion. After samples of Robredo Facial Cream were confiscated from Dilemma's belongings together with whatever is not allowed, it turned out that there is still a lot of work to do. 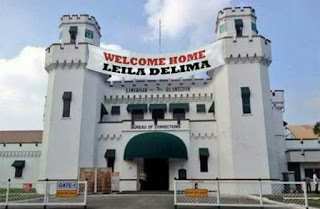 While the van entered into the Bureau of Corrections, a huge banner saying "Welcome Home Leila De Lima" was brought up. Party organizers were Unggoy Estrada and Ramon "Bong" Revilla Jr. More details were show that a welcome party was done in the Bureau of Corrections. 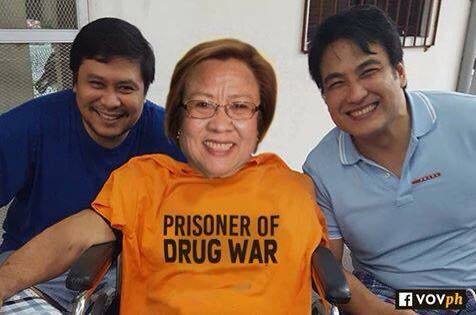 Indeed, a welcome party was given to Senator Dilemma. Photographic evidence showed that both Unggoy and Bong welcomed her with open arms. It turned out that while Dilemma and company are only given an electric fan for their cells but they were still able to order food. Among the inventory listed by detained pork barrel prisoners were the following: lechon baboy, soft drinks, grilled fish, barbeque, guso, lato, lugaw and macaroni salad. The incident made Justice Secretary Vitaliano N. Aguirre Jr. and PNP Chief Bato Dela Rosa open their jaws. Both of them could not believe how a welcome party was given to Dilemma. Both stated that there is still much cleaning up to do. Dilemma was last seen in good spirits and was seen dancing with pork barrel inmates. 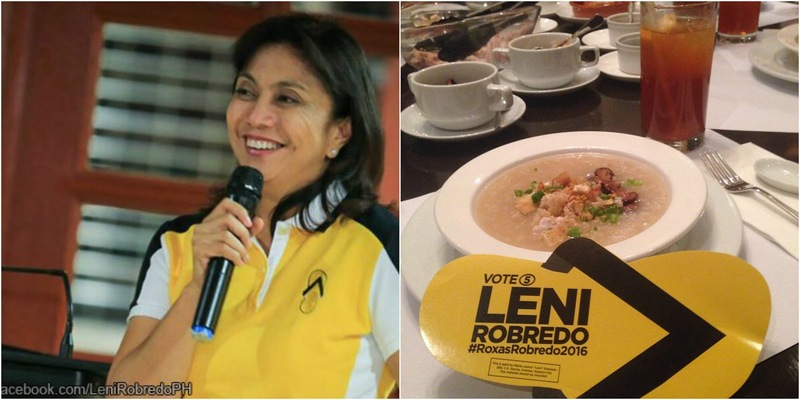 Investigation also revealed that #LeniLeaks also pointed out to Vice President Leni Robredo having catered to lugaw at Dilemma's welcome party. Although she did not cater to the lechon, grilled fish, barbeque, guso and lato but the lugaw was definitely Leni's Lugaw. Because of the incident new structures for appointment of Liberal Party members have changed. "Leni likes to cook porridge so much right? It may be best to unseat her as Vice President in favor of the new position as Minister of Lugaw at the Malacanang and the whole country. Also, we would like to announce that Antonio Trollanes IV will be appointed as the new energy secretary by the time I get the votes to secure Leni's position as head of the Lugaw Committee." said President Rodrigo R. Duterte who actually praised her cooking.